Due to inclement weather, this event has been cancelled. It will be rescheduled for the near future. 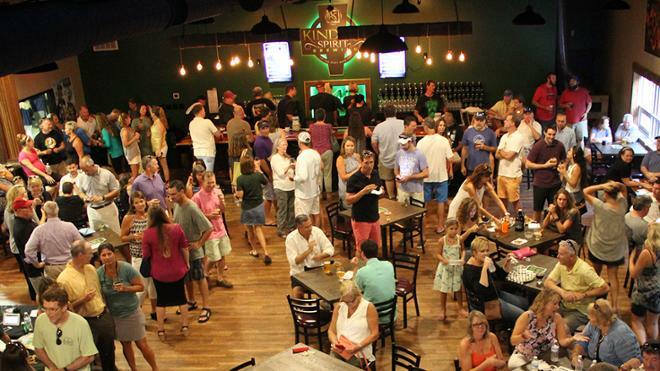 Join local University of Richmond SPCS students, faculty, staff, alumni, family and friends for a fundraising celebration at Kindred Spirit Brewing on West Creek Parkway in Goochland. Enjoy beer, sandwiches and refreshments; compete in the corn hole tournament; play a little foosball, arcade golf or a board game; watch sports on the big screens; and enter to win over $2,000 in door prizes while networking and catching up with fellow SPCS students, friends, graduates, deans and faculty. Use the “Register” button to purchase tickets. $20 per person includes two beer tickets, sandwiches and snacks. $10 per person includes two non-alcoholic drink tickets, sandwiches and snacks. All tickets include the chance to enter to win over $2,000 in door prizes. Complimentary brewery tours will be provided at 6:00 p.m. and 7:00 p.m. and are available first come, first served. Door prizes will be announced throughout the event and include one-night stays at The Commonwealth Hotel and Delta Hotels Richmond Downtown by Marriott, two 2018 season UR football game tickets, two 2018-19 season UR basketball game tickets, $100 SPCS noncredit class gift certificate, Osher membership, retail gift cards and more! A portion of the proceeds from this event will benefit SPCS student scholarships. We welcome additional sponsors: please visit our sponsorship page for details and payment. Prospective sponsors may also review our sponsor flyer for additional information. The event is hosted by Kindred Spirit Brewing, our partner in the Beer Brewer Professional Certificate program.